What is Thermal Image Scanning? 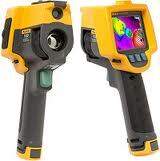 Thermal imaging uses infrared technology to detect very small differences in temperature. Every material has a unique thermal signature and when moisture, heat, cold, or wood destroying insects are introduced into the structure the thermal signature changes. The changes can be subtle or dramatic but with this incredible thermal image scanning technology the thermal signatures are detectable where they wouldn’t be able to be seen with the naked eye. 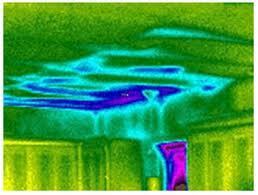 Moisture Detection in Walls and Ceilings – As demonstrated above,?thermal imaging is a great tool that helps to identifying water damage in walls, floors, and ceilings. By detecting the difference in temperature between a wet area and the surrounding dry areas thermal imaging can help detect moisture issues that would not be visible during a limited visual home inspection. It is also great at identifying areas where the insulation contractor failed to insulate adequately. Energy Audits – Thermal imaging has been a great tool to help homeowners save money, especially now that energy rates are on the rise. Heat loss and/or cold air influx can be detected and corrective actions can be taken to help improve the energy efficiency of residential and commercial structures. Once the energy wasting areas are identified, then changes can be made to make a dramatic difference in energy consumption which means less money out of pocket. Flat Roof Inspections – If you have a leak on a new to mid life flat roof and have been told that a new roof is needed, then call us first. We may be able to save you a substantial amount of money. Thermal imaging can be used to detect the precise location of the leak and mark the affected area so that repairs can be made to the leaking area. Obviously, if the roof is older then you should forego the thermal imaging and invest in the needed new roof. Electrical Inspections – Loose or dirty electrical connections and other?electrical anomalies can cause power outages and possible fires. We can inspect the electrical panels and receptacles to detect issues before there is a costly outage. Thermal imaging can detect hot spots in the electrical system not visible to the naked eye which may be a precursor to a larger issue. The resulting report can be a great aid for the repair electrician hired to address the identified issues. Plumbing Inspections – Water leaks from the plumbing system often leak undetected until major damage has occurred. We can scan in, under, and around plumbing fixtures in the home to determine if there is active leaking going on. Since this tool is not a moisture meter we will use it to find heat anomalies and then pursue the issue further to attempt to determine the source and cause of the leak. Thermal image scanning can detect temperature anomalies in the plumbing system not visible to the naked eye which may be a precursor to a larger issue. The resulting Thermal Image Scan report can be a great aid for the repair plumber hired to address the identified issues. We are often hired to help our clients with preventive maintenance programs or to pinpoint leaks in homes and businesses. To request a thermal image scan and/or moisture intrusion inspection add this service when scheduling. By adding a thermal imaging scan during the normal home inspection saves 40-50% off the normal stand alone thermal image scanning fee.